This blog post is a response to two questions often asked by BAL readers: "How do I start my Business Analyst Career? ", "Do I need a certification to become a Business Analyst?". While some began their BA careers by accident – they found themselves thrust in a BA role or performing business analysis work out of the blues, the story is different for others. If you’re looking to start your business analysis career or would like a career change and you’re not quite sure where to begin, this post is for you. Consider these tips on your journey to becoming a full-fledged business analyst. As a first step to determining how BA-ready you are, you should assess your current knowledge and experience. The BABOK Guide contains a list of tasks and techniques typically performed by business analysts. If you have been involved in some of the tasks before, you’re probably not as much of a newbie as you think you are. Scan through your CV and create a summary of the analysis tasks you have experience in. You should also be aware of the 3 BA job profiles: Generalist, Specialist and Hybrid. This categorization can help you decide which path to follow in launching your career. Most junior business analysts typically start as generalists before moving on to an area of specialization. However, be aware that not every Business Analyst role or vacancy is tagged “Business Analyst” – The role comes in different flavours. 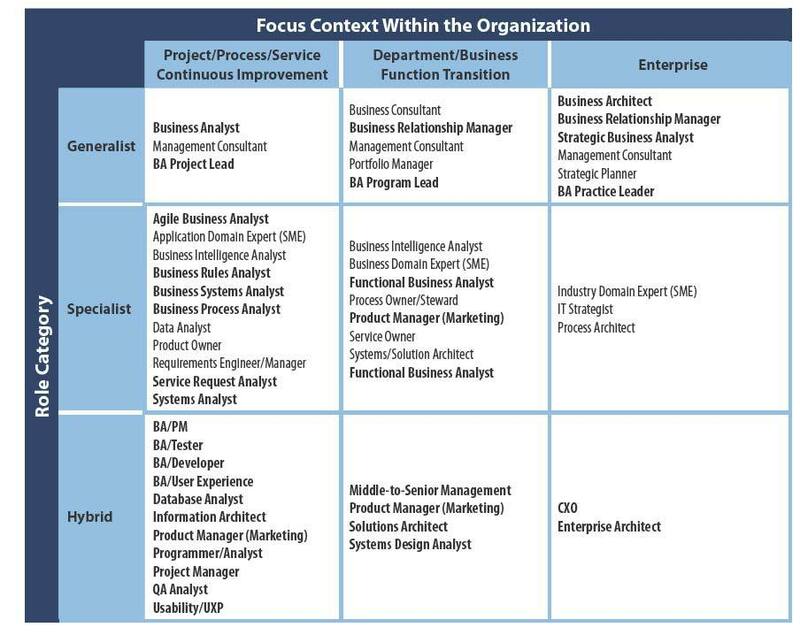 To illustrate this, the categorization (see screenshot above) from the IIBA Competency Model V3 specifically contains the profiles you can expect to find in each role category though job descriptions/profiles often flow into one another. For example, a Business Process Analyst may perform the same tasks as a Business Systems Analyst. Be clear on what kind of Business Analyst you want to be in order to identify the training that best suits your requirements. Once you're clear on the path you'd like to pursue, you can start exploring training options. This is not to say that you cannot enter the business analysis field without training. You can. Training can, however, be extremely beneficial if you are starting from a blank page, looking to get a certification or learn about a specific aspect of business analysis. You could opt for a training that prepares you for a BA certification; training that focuses on Business Analysis concepts or practices; or specialized training that focuses on certain techniques. It all depends on where your interest lies. There are lots of training methods available. If you do a quick search online for BA trainers, you’ll get online business analyst courses, trainers that can come to your office (these tend to be customized) if your company is willing to pay or those that offer public classes you can attend (these tend to be cheaper and usually last for 3-5 days. There are also some tertiary institutions with formal degrees geared towards grooming BA Professionals. You could opt for a business-related course with elements of IT Management (which may or may not have elements of business analysis). The type of trainer and mode of training will of course, determine the cost. See tips on how to select a business analyst trainer. Be aware that a paid training option is not the only way to learn business analysis. You could opt for self-study or organize group study sessions where you can discuss BA concepts with fellow analysts. As a start, here's a list of free training online that can help you get your feet wet. Learning Business Analysis through experience is one of the most effective ways of building confidence in your abilities and convincing prospective employers that you are up to the task. You could for instance, simply apply the ideas in the BABOK to your daily tasks, if you get the opportunity. The BABOK techniques can easily be applied to your projects (without training) once you understand the principles. Paid employment is, however, not the only way to gather some experience. You could volunteer to be part of a project that involves analysis. This way, you would gain a deeper understanding of what it’s like to be a business analyst and have some experience to add to your CV. Tip 4: Certified: To Be or Not to Be? So, do you really need to become certified? Let’s take a look at the benefits of becoming a certified business analyst. The whole process of obtaining a certification (reading, absorbing and applying the material) will unveil the art and principles of analysis to you. The persistence you apply to understanding the certification material will be worth it as you apply the knowledge to your projects. However, the certification is not an end in itself. Ultimately, it’s your understanding and ability to deliver results on your projects, as well as the will to continually improve your skills, even after becoming certified, that matter. Getting certified (which is only one of many factors) can help to convince prospective employers that you have the necessary skills and knowledge to fit any BA role, thus giving you an edge in the market. So, here it is: if you can get certified, why not? For information on the benefits of CCBA/CBAP and BCS BA certifications, you may visit the IIBA and BCS websites. I’ve also written an article on what to expect from each type of certification, which can help you make up your mind. Once you’re in the camp, don’t let the flame burn out. It’s easy to get caught up in the tide of multiple projects at work. Join business analyst communities and forums where you can meet new contacts and rub minds with like-minded analysts. Ask for advice and resources when you need help. Subscribe to business analyst newsletters and blog posts to keep you updated on new developments and join the discussion. As far as becoming a business analyst is concerned, the sky is your limit.